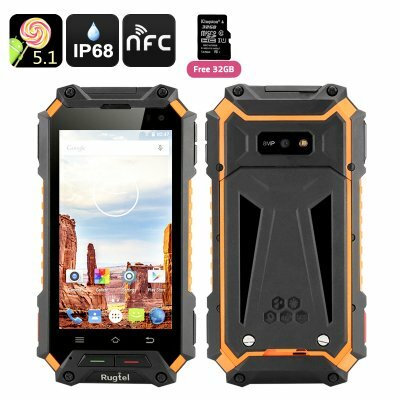 Successfully Added Rugtel X10 Rugged Smartphone - 4.5 Inch IPS Screen, 4G, Android 5.1, IP68, NFC, MTK6735M Quad Core CPU, 2GB RAM + 16GB Memory to your Shopping Cart. With the Rugtel X10 rugged smartphone, you don’t have to worry about casing up your phone before taking it outdoors. The smartphone comes with a compact 4.5 inch IPS screen and is waterproof, dustproof and shockproof. Enjoy total freedom with the Rugtel X10 rugged smartphone that is resistant to tough weather and can accompany you anywhere you want to be. The phone features IP68 rating and that means it is totally dustproof, shockproof and can be immersed in water for up to 1 meter. The 4.5 inch screen is of optimal size for giving you enough media space, while offering great portability. Android 5.1 is always a great interface to have on your smartphone - simple, to the point and with easy Play Store access. 4G connectivity and the support of two SIM cards come with great connectivity, letting you enjoy fast web speeds and conveniently separate work and social life with two mobile accounts. However, the Rugtel X10’s rugged qualities are the real highlight. In addition to being waterproof and dustproof, the phone comes with a powerful LED flashlight to help you find your way in the dark. When it is cold outside your fingers needn't suffer when you want to use the phone and thanks to the Rugtel X10's Glove mode screen you can interact with the device without removing your gloves, it also features an SOS button for emergencies. OTG enables efficient data copying with other devices and with NFC you will be able to exchange data wirelessly by simply tapping two compatible phones back to back. The 3050mAh battery comes with up to 9 hours of continuous talk time and around 350 hours on standby.